Damiro (v. Ramiro Z-Alme Z) zählt heute zu den gefragtesten Hengsten weltweit und produziert Spitzenpferde für den Springsport in Serie. Damiro's pedigree contains a powerful combination of Europe's top jumping blood. In 1988, Damiro was the champion of his performance test, achieving five 9's and two 8.5's. 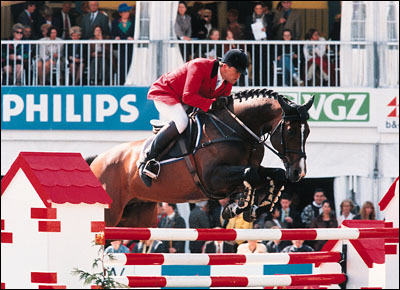 He after became the winner of the A-competition jumping season 1989/90. Damiro has four approved sons: Hilton (sold as a jumper to Italy), Ids, Douwe, and Le Byou p. (sold as dressage sire to South America). Damiro was ridden by Wout-Jan v.d. Redoubt, to several victories, including the winter indoor championships Leiden, where he was champion. In Bordeaux he was winner in the Two Fences parcours (where he jumped two meters) and fourth place in the jachtspringen. Furthermore, he placed well in Rotterdam, Amsterdam, Calgary and Geneva. Damiro stands at seventh place on the index with 142 points. Damiro's young sports horses appear to be following in his hoofprints. Included among his successful four, five and six year olds are Mr. Itt, Jamiro, Kimberly and Impact.